The bookstore will launch its own magazine, entitled The Sandspout (although the title will be in small print as I’m quite ashamed of it.). A Sandspout is the sand sucked into the air by a whirlwind: such apparent serendipity, of course, rivals the nature of this bookstore, hence the magazine’s title. The first issue will be published in late January, and will comprise 128 pages, A4, of short story, poetry, article and serendipity, its rationale that it is in some way linked to the shop. It is not unlikely that its format will be changed as it develops. For the first issue, poets included are Michael Horovitz, Heathcote Williams, Nancy Campbell, George Roberts and Camille Ralphs, with short stories by Olivia Stewart Liberty, Allyson Armistead, Alistair McNaught and Marc Nash, and essays contributed by Gilad Atzmon, Heathcote Williams and others. 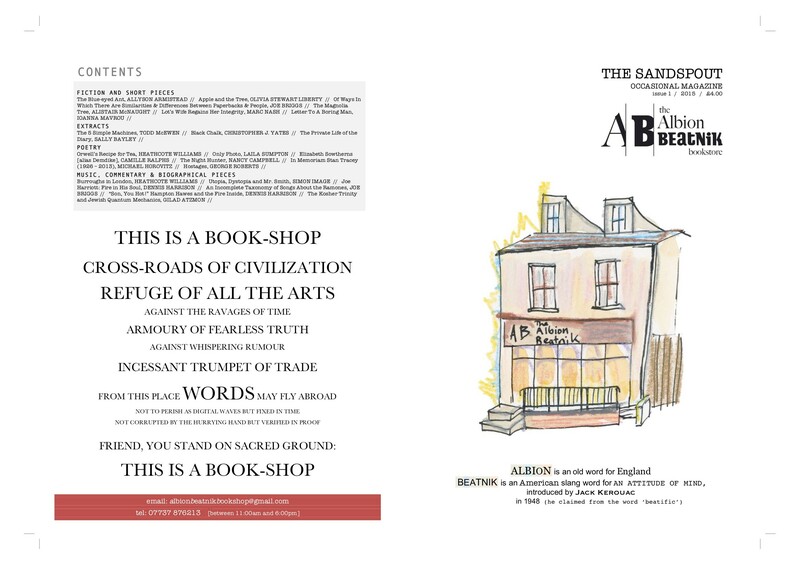 I am unaware of any other bookshop with its own magazine – even chain bookshops – so hope folk will see this as a chance to support the bookstore without spending too much money. The price will be £4.50. If anybody has a piece of writing to contribute, of any nature, please get in touch, initially by email [ albionbeatnikbookshop@gmail.com ]. Occasionally a fee is paid, but is so small that it will fund, just, a jar of Marmite and a packet of Jacob’s Cream Crackers (so make sure you have no intention to give anybody a snog for a few days after payment, and that only when you’ve chased me and spoken to your solicitor). There will be four issues per year. It is likely that each issue will be linked to a particular country, and may involve the participation of another bookshop from that country. This entry was posted on 28 January, 2016 in homepage and tagged Albion Beatnik Bookstore, Alistair McNaught, Allyson Armistead, Camille Ralphs, George Roberts, Gilad Atzmon, Heathcote Williams, Jericho, Marc Nash, Michael Horovitz, Nancy Campbell, Olivia Stewart Liberty, Oxford, The Sandspout Magazine. Bookmark the permalink.